Former U.S. President George H.W. Bush passed away at the age of 94 on Friday, November 30. UNITED STATES—George H.W. 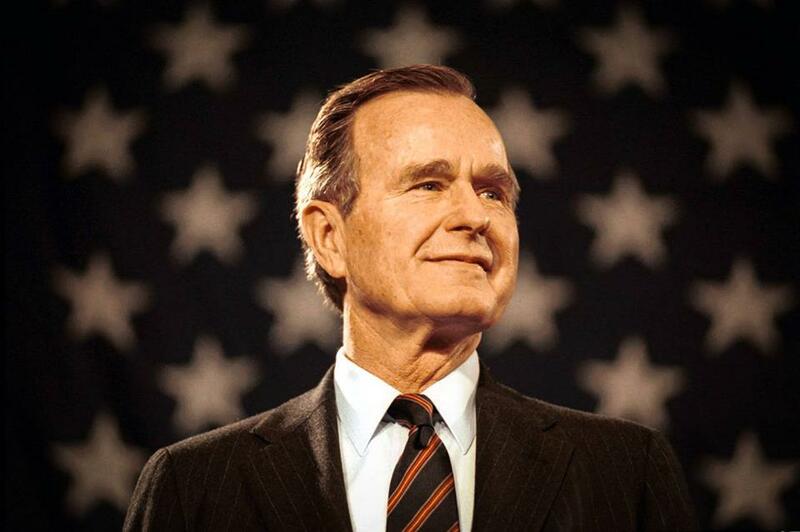 Bush, the 41st President of the United States and internationally respected political leader passed away on Friday November 30, at the age of 94. While Mr. Bush is remembered by Americans for his role as commander in chief, his legacy extends beyond the Oval Office. Prior to holding office as President of the United States of America from 1989 to 1993, in 1938, he attended Phillips Academy in Andover, Massachusetts where he held a number of leadership positions in academic and athletic settings. In December 1941, Bush enlisted in the U.S. Navy on his 18th birthday. He trained as a naval aviator and after 10 months of training, he became an ensign in the United States Naval Reserve at the Naval Air Station in Corpus Christi, Texas just days before turning 19. He became the youngest naval aviator to that date. A year later, he became a member of Air Group 51, a task force that was victorious in the Battle of the Philippine Sea, one of the largest air battles of WWII. That same year, Bush was promoted to junior grade lieutenant and piloted one of four Grumman TBM Avengers that attacked Japanese forces. On one of these missions, the team encountered extreme return fire from the Japanese and Bush’s engine was hit and caught fire. He completed his attack and ejected himself from the aircraft, landing safely in the ocean below and awaited a submarine to rescue him. In a letter written to his parents he wrote, “I turned the plane up an attitude so as to take the pressure off the back hatch so the boys could get out. After that I straightened up and started to get out myself.” He was awarded a Distinguished Flying Cross. A few months later, he returned home and married Barbara Pierce. Upon leaving the Navy, Bush enrolled at Yale and graduated in 1948 with a degree in economics. With his degree he headed to Texas starting first at an entry-level job at a Texas oil company. It was in Texas that Mr. Bush first started his political career, as the leader of the Harris County Republican Committee in 1963. Three years later, he left his career in the oil industry behind to pursue a seat in Congress in a suburb of Houston. He won and was re-elected again in 1968. Following two Senate candidate defeats, Bush aimed to become the United States ambassador for the United Nations. President Richard Nixon supported him and Bush was confirmed in 1971. His political career had a rocky start with the United Nations and the Watergate scandal that upset the Nixon administration. In the face of Nixon’s resignation, Bush traveled to China to serve as the unofficial ambassador to repair diplomatic relations. In 1976, U.S. President Gerald Ford summoned Bush back to the United States to lead the CIA. In the wake of Watergate scandal, Bush reinstated morals and values back in the CIA. A year later, he returned to Texas and commenced a campaign for President of the United States. Bush positioned himself for the vice-presidency, where in November 1980, the Ronald Reagan-Bush ticket won the election. Bush focused on a campaign for U.S. President after Reagan completed his two terms. In January 1989, George H.W. Bush became the 41st President of the United States. During his four year term, he led the U.S. through the end of the Cold War, conflict with Panama and China, and the domestic economic crisis. He negotiated the Americans With Disabilities Act, signed the Strategic Arms Reduction Treaty, and doubled the size of the United States presence in the Persian Gulf. Economic turmoil dominated the end of Bush’s presidency. Following his loss to Bill Clinton, Bush returned to Texas where he would continue an active lifestyle both in the public eye and with his family. His son, George W. Bush would go on to become the 43rd president of the United States after being elected in 2000. George H.W. Bush is survived by his five children, 17 grandchildren and 8 great-grandchildren, and two siblings. He is proceeded in death by his Barbara, his wife of 73 years, who passed away in April 2018. “America is never wholly herself unless she is engaged in high moral principle. We as a people have such a purpose today. It is to make kinder the face of the nation and gentler the face of the world,” said Bush during his inauguration speech in 1989 to the American public.